This is a flat-bottomed 16-foot fishing boat called a gandelow (see WB 249 and 250) used in the Shannon river estuary of western Ireland. It is being rowed by Liam O’Donoghue (Shannon fisherman) and Elan Broadley (A K Ilen Boat School apprentice) in Blind Harbour on the south-west coast near Baltimore (the Irish one!). You can see a video of them rowing here: https://vimeo.com/user50587631 (the mast and 2.5HP outboard are optional extras)! The boat was built in the UK by Patrick Beautement (see the progress blog at: http://www.beautement.com/Boats/15-foot_Gandelow/15-foot_gandelow.html ) using Scots Pine for the floor and planks, Utile for stem and stern post and transom, and French oak for the frames (ribs). It was initially launched and named at Staunton Lakes in Gloucestershire, UK but not properly christened till it got to Ireland. The design is a scaled down adaptation of the traditional 23-foot boat (rowed by three people) and basic plans are available on the blog. 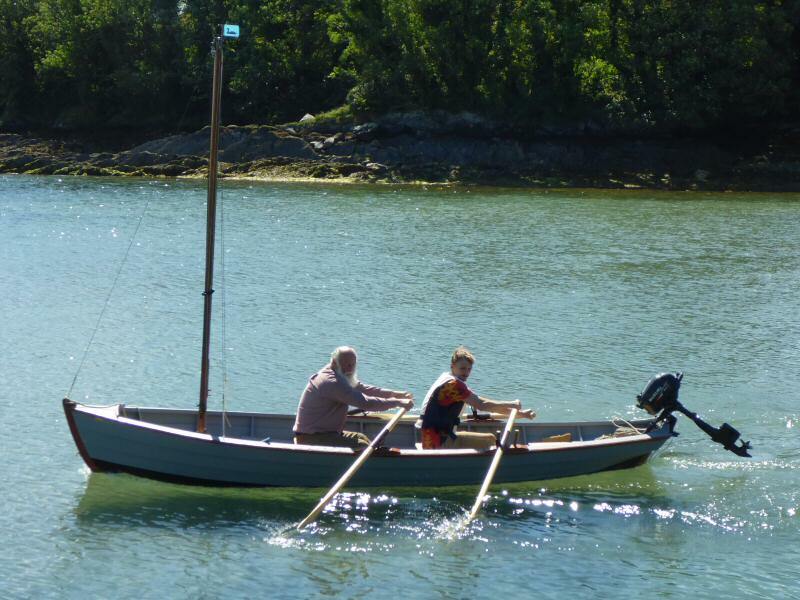 The boat has now been given to the A K Ilen Boat School (www.ilen.ie) for use by its students and as a pattern to copy.